When you think of the four C’s, you probably think of diamonds… but did you know they have a place in education, too? Creativity, communication, collaboration, and critical thinking are a foundational component of dynamic learning. In fact, I even like to call them the superfoods of learning! If this is the first time you’re tuning in, I just want to let you know that this is part of a five-episode series. I recommend starting with episode 1, then listening through in order to get loads of tips, ideas, and templates that will help you encourage dynamic learning in your classroom! Speaking of dynamic learning, it’s important to understand what this term means before we dive into the four C’s. In short, dynamic learning is characterized by constant change and activity, and tends to extend beyond the school day and the classroom. Static learning, on the other hand, has an overall lack of movement, growth, and action and takes place within the traditional school day. With this in mind, think about the nutritional value of the learning in your classroom. In your nutrition facts, four important components are the four C’s I mentioned before (creativity, communication, collaboration, and critical thinking). And just like in an actual diet of food, it’s important to have balance in your lesson nutrition facts. You probably hit communication and collaboration a lot, but do you always include creativity and critical thinking? Tune into this episode to learn about each of the four C’s, how they relate to each other, and how you can start implementing them into your classroom in ways that will be powerful and successful for your students! Don’t forget to download today’s freebie, the Epic Download Bundle! It includes the 4 C’s Digital Learning menu, along with way more value-packed freebies that will help you encourage dynamic learning in your classroom. [00:28] - Welcome back to the show! Kasey introduces today’s topic, the four C’s (or the superfoods of learning). 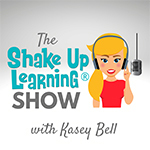 [02:27] - Kasey gives a shout-out to the Shake Up Learning Community managers: Pam Hubler and Susan Vicentz. [03:14] - We learn that the four C’s are creativity, communication, collaboration, and critical thinking. [04:20] - Kasey explains what dynamic learning is (as opposed to static learning). [07:09] - Think about the nutritional value of the learning in your classroom, Kasey recommends, and explains what this means and how it involves the four C’s. [11:13] - Kasey shares a way to give your classroom metabolism a nutritional boost: feed it the most nutritious, dynamic learning experiences that you can. [11:38] - We hear about the essential components for dynamic learning, which are the four C’s. [13:11] - Kasey defines and explores the first of the four C’s: creativity! [16:16] - Kasey offers some examples of how to include creativity in what you currently teach. [18:33] - If you want to be creative, you have to be willing to take creative risks, Kasey points out. [18:59] - The next of the four C’s is critical thinking. This is the ability to conceptualize, analyze, synthesize, and evaluate information, Kasey explains. [20:52] - We hear examples of ways to use critical thinking in the classroom. [23:38] - Kasey invites listeners to think about the overlap between critical thinking and creativity. [24:25] - Next on the list of the four C’s is communication. [25:24] - A podcast is the perfect example of trying a new medium, Kasey points out, and talks about her own experience in trying podcasting in a class. [29:46] - Kasey lists some other mediums for communication, including comic strips and storytelling. [30:23] - Kasey moves onto talking about collaboration, offering a definition and talking about what she’s seen happen in the classroom. [31:56] - We learn about the importance of role-setting in creating successful collaboration. [34:31] - In what ways are you already integrating the four C’s into your curriculum? Where are you lacking? [36:20] - Kasey talks about the dynamic learning experience and how the four C’s are foundational. She illustrates this through the 4 C’s Digital Learning Menu. [39:27] - Kasey goes into today’s learning menu in more depth, and mentions the teacher’s guide that will help you tweak the menu for your own classroom. [43:57] - We learn about what’s included in the Epic Download Bundle. [44:40] - New episodes of this podcast will come out every Tuesday, Kasey explains. She also shares this week’s question of the week: in what ways are you already integrating the four C’s in your curriculum? Please share the answers in the Shake Up Learning Community or on your favorite social media platform! [45:26] - Kasey challenges listeners to download the freebie, and share this episode with at least one other teacher. Also please join the Shake Up Learning Book Study! [47:41] - Thank you for listening to today’s information-packed episode! Stranger Google: Crazy Tools From the Upside Down (Part 1)!